Every system requires connections of some sort – cables, plugs and more. And the quality of each and every one of these connections has a direct bearing on the performance and long term reliability of the system. Even if you felt the change of a single plug might make a negligible difference (and there are many who think this only to be surprised by the impact of such a small change), you would have to agree, that many small improvements can add up to make a compelling a satisfying improvement when looking in the context of a complete system. And so we regard the selection of the appropriate cables and connectors to be as an important an aspect, as the choices made in terms of individual components. If fact – we can show you that the differences we can make in this area can be at least as great and often more cost effective than actual component changes. "From the first few notes, we just looked at each other, with a look of surprise on our faces. Detail, speed, ambience and a total sense of space, around each individual instrument and voice. Notes that used to just end abruptly, now have an ambient trail of decay, as if you can sense the size of the room the instrument was recorded in. There's detail we just couldn't hear previously. 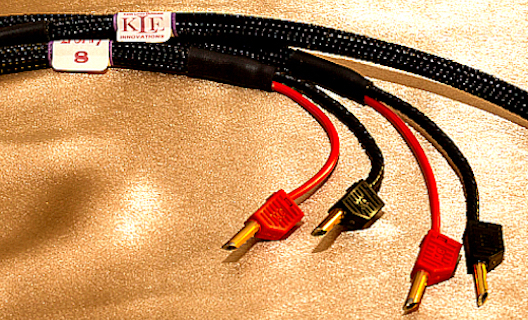 I could go on with superlatives, but to say the KLEI cables are quite remarkable, is nothing short of fact." KLEi gPower2 AC Mains cables. This is where it all begins. If you have any component with an IEC mains socket we strongly recommend the the new KLEI gPower2 as the first cable you consider. It’s one of the most affordable cables in the range yet many of our clients have been blown away by the improvement it makes to the sound of their system. Power is the raw material that makes your system work and this cable does remarkable things to the performance of many amplifiers, disc players and DACs. It will surprise you to hear the gains made are often greater than that of upgrading speaker cable or interconnects. But more importantly it sets the stage for further improvements. From NZ$500. Read the full story here. KLEI gZero Analogue & Digital Interconnects. All these cables feature a unique blend of materials, internal architecture and plugs. As you go up the range, material differences in both the conductor and complexity of construction delivery greater levels of detail, broader sound staging and better bass. All models of analogue interconnect are remarkably quiet with both effective shielding and a painstaking and original approach to grounding. The entry level Analogue interconnect cable offers remarkable performance for only $315 a pair. The two Digital Interconnects are superficially similar to the analogue cables but are dedicated 75 ohm models. More on the analogue and digital interconnects here. Each set of the KLEI gZero Speaker Cables are hand made, terminated pairs - you can’t get this cable on a roll. The sound produced is almost at odds with the quite simple and slim appearance - the entry level gZero 2 SC is very balanced, sweet and smooth. The gZero6 SC is dramatically better with exceptional bass and a more open and expansive sound. Both are almost organic in their character without a complete absence of harshness, yet seem able to deliver exceptional detail form an absolutely silent background. More. Keith’s ultimate cable designs are something else again. There are 3 models of analogue interconnect and one speaker cable. The internal architecture and materials used are well in advance of the gZero series. These cables all reveal a staggering amount of previously unresolved detail, delivered from an eerily quite background. Between the 3 models the gains are most obviously in the scale of sound stage and bass performance. Read our personal review of these cables here. The new KLEI Harmony series RCA plugs are a dramatic improvement over the original Eichmann Bullet plug. The 4 different versions of the plugs play a big part in performance of the interconnect range. You can buy these plugs separately to either upgrade many existing interconnects or as the basis for your very own cable designs. We are also enthusiastic proponents of the Kimber Kables and a carefully selected range of other specialist and installation targeted cabling systems. Kimber is our next best recommendation for value below the KLEI products. In the range there is some great value for money speaker cables and interconnects. Simply put, they sound better than anything else we can find at their price level They are well constructed and pliant with good plugs on the interconnects and work in pretty much any system. For home theatre and house installations we would almost always opt for Kimber cable. For USB and optical digital Kimber is our first port of call. To get the full potential from new generation digital amplifiers and DACs, you need quality digital cables. These need not be crazily expensive. Good design, construction and termination go a long way to delivering you a significantly improved performance. We’ve looked at many options and have settled on the British QED. for our entry level cable range. At the outset, you can make a new system perform above and beyond expectation. Or renew and improve the performance of an existing system with a few judicious additions. The trick is simply knowing what is available and heading towards the most appropriate items for your particular set of circumstances. So if you would like to discuss this with us contact us here.